The Park Hotel is spread across an area of 5,000 square feet, nestled in the heart of Musssorie, is a perfect family getaway, it offers all modern conveniences coupled with warm hospitality. The balcony at The Park provides a birds eye view of picture palace in Mussoorie. The Park Hotel is just a stone throw away from Mall Road yet away from the maddening crowd. Your car will reach right up to the gate of our hotel without any hassles of paying and crossing the barrier for the Mall Road. It provides easy access to all places of tourist interest in and around Mussoorie. Note: The Park Hotel is currently not in service. We will update the latest information once it starts operating again in Mussoorie. 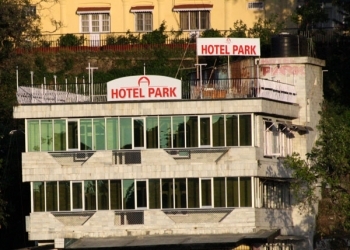 Hotel Park is located just before the Mall Road entry in Mussoorie, near picture palace. A tasteful blend of 18 Superior Deluxe, Deluxe and Executive Rooms in Mussoorie Park hotel, with a view of majestic snow capped Himalayas/twinkling Valley of Dehradun makes it a perfect reclusive abode amidst nature in Mussoorie. 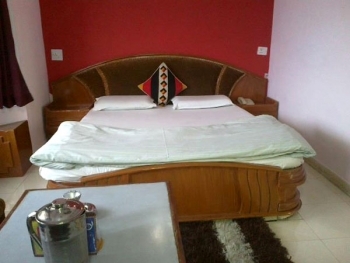 - Superior Deluxe Room: Our spectacular Triple Bed or Double Bed Superior Deluxe bedrooms overlook the Picture Palace Mall Road of Mussoorie on one side and Dehradun Valley on the other. The rooms are luxurious havens of tranquility and comfort, designed to pamper and relax you throughout your stay. - Family Suite: an interconnected twin room set, perfect for families or small groups of friends. This suite features two bedrooms each with a private bath. - Deluxe Room: The Double Bedroom Twin view rooms offer beautiful views of Lal Tibba, the highest point of Mussoorie, alongwith the beautiful lush green landscapes of the pristine part of town. 20 cover rooftop cafe with a birds eye view of Picture Palace and around becomes your stage for a perfect evening of joy with your friends, family or special ones. Extra Bed Charges : Child-25% of package and Adult - 35% of package cost. Extra bed on EP - Rs.300. Hotel Park is just 38 Kms from Dehradun is Mussoorie with its green hills and varied flora and fauna, is a fascinating hill station. Hotel is about 290 km north from New Delhi.